The Compass Rose 2012 - Sahara geocoin reflects a diversity of images as grand as the continent that inspired it. On the front of the coin, the compass points hold images of some of the most awe-inspiring animals on the planet. The Compass Rose 2012 - Sahara geocoin reflects a diversity of images as grand as the continent that inspired it. On the front of the coin, the compass points hold images of some of the most awe-inspiring animals on the planet. The Lion, king of the beasts, once ruled the North. The majestic Elephant points his trunk to the East. A Great White Shark breeches the ocean surface in the South. And the migrating Wildebeest leads his herd westward to the watering hole. 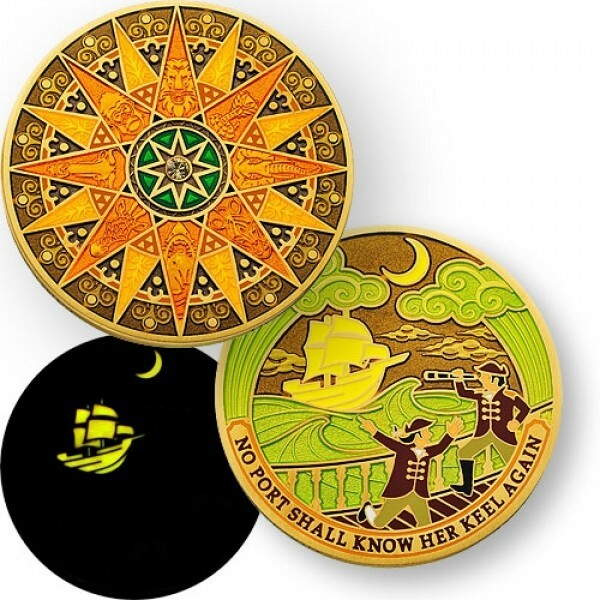 The back of the coin features a scene depicting two frightened sailors as they catch sight of the legendary ghost ship...The Flying Dutchman! 17th-century nautical folklore holds that the crew of the Flying Dutchman encountered a violent storm off the Cape Of Good Hope. It is said that the captain refused to turn back, exclaiming: “I will round this Cape, even if I have to keep sailing until doomsday!” And so he does, appearing as “a phantom ship all aglow” that shall never make port again.